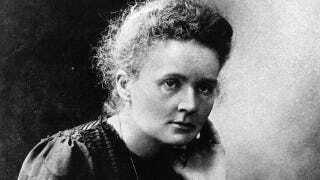 Good news if you’ve been waiting around for a movie about the life of Marie Curie—and haven’t we all, really? “Within a space of six years, she gave birth to a child, lost her beloved husband with whom she shared her passion for scientific research and fell in love again (with a married man) sparking a high-profile public scandal, and then she wins another Nobel to top it all off,” Noelle told AFP on location in the central Polish city of Lodz this week. “In Europe, while we know that girls are better at math there are only 13 percent of women in high-level scientific research,” said Noelle, who studied mathematics before taking up film-making. The film is supposed to hit theaters February 2016 or so, though God knows when America will get it.